After the confirmation of 49-year-old banker and economist, Sanusi Lamido Sanusi, as the 10th Governor of the Central Bank of Nigeria (CBN) by the Senate, more reactions have continued to greet the appointment. "This is one of the best appointments the President has made. You can see that his answers to questions impressed the senate and when the voice vote was called there was no single dissent," Ayogu Eze, Senate Committee Chairman on Information, said. Sanusi's confirmation came despite opposition by some lawmakers who believed it would violate the principle of Federal Character as stipulated in the 1999 constitution. Some other public analysts have equally kicked against it on the same ground. The senate also confirmed the appointment of Babatunde Lemo as a Deputy Governor of the apex bank, established in 1959. According to Section 14 (3) of the Constitution, the appointment from the same state and ethnic group in a particular Federal Agency or sector is outlawed. The new CBN Governor hails from Kano State in Northern Nigeria like current Finance Minister, Mansur Muktar, and National Planning Minister, Shamsudeen Usman. "He is an economist and banker by nature with years of cognate experience in the sector. I must also remind this country that the populace does not care from where you come from, what happens is policy and implementation to better the lives of the people . He should also remember he is there not at his pleasure but at the pleasure of the whole people of Nigeria. I am sure he will perform,” President of the Lagos Chamber of Commerce and Industries, Solomon Onafowokan, told journalists. 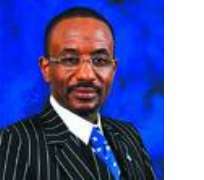 Sanusi, until his new appointment, was the Chief Executive Officer of First bank Of Nigeria Plc. He is taking over from Professor Charles Chukwuma Soludo, as the 10th CBN Governor since it was established in 1959. Fielding questions from the senators for more than two hours, Sanusi said he would build upon the reforms embarked upon by his predecessor and the achievement recorded to institute machinery for closer monitoring of activities in the sector. He blamed the slide of share prices on the floor of the Nigerian Stock Exchange (NSE) on the failure of risk management mechanism by the NSE, the Securities And Exchange Commission (SEC), and the banks. Sanusi said "Basically, you had a stock market that was an accident in waiting to happen. 70% of the valuation of the exchange has equities and no depth. 70% of the valuation of the stock exchange is banking stocks. Now anybody can tell you upfront that this is an unstable structure. Speaking shortly after his confirmation, Sanusi pledged to leave up to expectations “We thank God. One is really at this moment just overwhelmed with the sense of responsibilities and we can only hope to rise to the challenges of the expectations Nigeria have on us."